Vedic Hindu sacred literature is a treasury of hymns, legends, mythology, philosophy, science and ethics. From among this vast body of writings, each lineage recognizes a se­lect portion as its secondary scripture, called smṛiti. While the Vedas and Āgamas are shared as part of every Hindu’s primary scripture, śruti, each sect and lineage defines its own unique set of smṛiti. The sacred literature, puṇya śāstra, from which smṛiti is drawn consists of writings, both ancient and modern, in many languages. Especially central are the ancient Sanskrit texts, such as the Itihāsas, Purāṇas and Dharma Śāstras, which are widely termed the classical smṛiti. In real­ity, while many revere these as smṛiti, others regard them only as sacred literature. Smṛiti means “that which is remembered” and is known as “the tradition,” for it derives from human in­sight and experience and preserves the course of culture. While śruti comes from God and is eternal and universal, the ever­-growing smṛiti canon is written by man. Hinduism’s sacred literature is the touchstone of theatre and dance, music, song and pageantry, yoga and sādhana, metaphysics and ethics, ex­quisite art and hallowed sciences. The Mahābhārata and Rāmāyana are Hinduism’s most renowned epic histories, called Itihāsa. The Purāṇas are popular folk narratives, teaching faith, belief and eth­ics in mythology, allegory, legend and symbolism. Hinduism’s poetic stories of rishis, Gods, heroes and demons are sung by gifted paṇḍitas and traveling bards, narrated to children and portrayed in dramas and festivals. The Mahābhārata, the world’s longest epic poem, is the legend of two an­cient dynasties whose great battle of Kurukṣettra is the scene of the Bhagavad Gītā, the eloquent spiritual dialog between Arjuna and Krishna. The Rāmāyana relates the life of Rāma, a heroic king revered as the ideal man. The Purāṇas, like the Mahābhārata, are encyclopaedic in scope, containing teachings on sādhana, philosophy, dharma, ritual, language and the arts, architecture, agriculture, magic charms and more. Of eighteen principal Purāṇas, six honor God as Śiva, six as Vishnu and six as Brahma. The witty Pañcha tantra, eminent among the “sto­ry” literature, or kathā, portrays wisdom through animal fables and parables. In addition to the epics, legends and supplements to the Vedas and Āgamas, there is a wealth of Hindu metaphysical, yogic and devotional writings. the sūtras by Kapila, Patañjali, Jaimini, Badarayana, Kaṇada and Gautama. Hailed as leading occult works on yoga, āsanas, nādīs, chakras, kundalini and samādhi are the Yoga Sūtras, Tirumantiram, Yoga Vāsishṭha, Śiva Sūtras, Siddha Siddhāṅta Paddhati, Jñāneśvarī, Hatha Yoga Pradīpikā and Gheraṇḍa Saṁhitā. 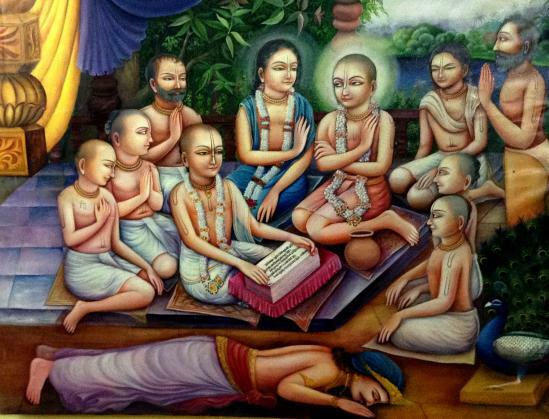 Widely extolled among the bhakti literature are the Bhagavad Gītā, Nārada Sūtras, Tiruvasagam, the Vāchanas of the Śivaśaraṇās and the hymns of mystic poets like Surdas, Tukaram, Ramprasad, Mirabai, Andal, Vallabha, Tulsidas, and the saintly Nayanars and Alvars. Click to Go! Cannot find? - Check other categories or ask! Good Luck!